While 79.7% of online Australians now watch videos online, the nation is only the seventh most prolific user of online video per capita in the Asia Pacific region, according to comScore. The web monitoring firm’s Video Matrix tool shows that four in five online Australians accessed internet video in June, putting penetration levels behind highly-developed neighbours, such as Hong Kong, Singapore and Japan, as well as less developed neighbours and the global average. 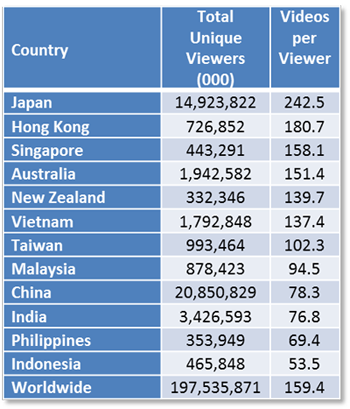 However, in terms of the number of clips watched per viewer, Australia moves up the rankings to place fourth with an average of 151 clips watched per viewer in June. Senior vice president for comScore in Asia Pacific, Joe Nguyen, comments that watching video clips online is now part of the diet of most online consumers, and is expected to grow across the region. “Online video viewing has become a leading pastime for the majority of today’s online consumers, presenting new opportunities for content providers and advertisers to reach their key audiences with engaging content,” Nguyen says. Video viewing penetration across the region ranged from a low of 66.9% in Indonesia to a high of 89.8% in Vietnam, as both broadband access and content availability factored into online video viewing adoption. 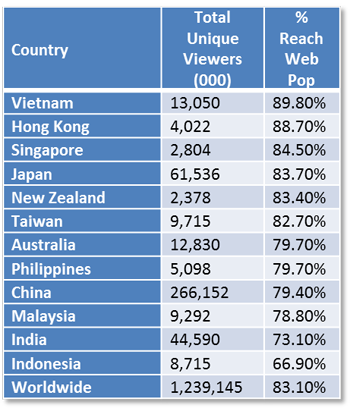 Vietnam, Hong Kong (88.7% reach), Singapore (84.5% reach), Japan (83.7% reach) and New Zealand (83.4% reach) all saw online video penetration exceed the global average of 83.1%. With an ageing population, Australia’s lower penetration of online video watchers could simply be a reflection of the less sophisticated web habits of older generations. The quality and depth of video content available to Australian audiences, a topic that attracts considerable debate within the industry, appears to be healthy with the average number of clips watched per viewer high relative to the rest of the region. To see an in-depth analysis of Australia’s online video behaviour, view Marketing‘s ‘Online Video Snapshot’ infographic here. In June, the average Australian video watcher consumed 151 clips, a slight decrease on usage recorded in April when viewers accessed an average of 158 clips each. On balance this would put our current usage on par with Singapore and behind only Hong Kong, with 181 videos per viewer in June, and Japan, with a staggering 243 videos per viewer for the month.